Do you want to be an author of great blog posts? Bookmark this blog post checklist. It explains how to prepare, write, finalize, promote, and evaluate your blog posts. I created this blog post checklist for writers of blogs who often try their best, but fail to implement even the simplest blogging tips. Now you have no excuses anymore. Now you have a checklist! Next time you write a blog post, try to follow the following simple guidelines. Be a great author! Pick your goal. NO! Don’t start writing now. Think! Why are you writing your blog post? What do you want to achieve with it? And, is there a way to measure that? Do you want more comments? More subscribers? More likes or +1’s? For many blog posts it’s hard to measure the effects directly. But it can’t hurt to try. You’ll be surprised what you can learn from your metrics. For example, for this post my aim is to create a “pillar post”. It is the kind of blog post that people keep returning to, and I hope to validate it by a observing a steady flow of page views over a looooong time. We’ll see. Determine keywords. Use Google’s Keyword Planner to check the search volume of keywords. Pick one or two key phrases that at least some people search for, but don’t pick a phrase that has too much competition! Really, you can’t compete with half the world. Aim for the “long tail”. “How to write a blog post” has a huge amount of competition, while “checklist for blog posts” has no search volume at all. I settled on “blog post checklist” and “great authors” as the two key phrases for this post. Both enjoy a small number of searches per month. Pick a great title. The title is the most important part of your blog post. It should make people curious. It should entice them to click on it! Consider explanations (“how to…”), questions (“what if…”), commands (“do this…”), mysteries (“the secret to…”), or fear (“the dangers of…”), and aim for people’s intrinsic desires. Check other posts. 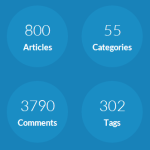 Search for blog posts by other people that were written about the same topic. Don’t start writing until you know what others have already said before you. Please, don’t be boring by repeating the obvious! You can consider making your post a reply to those other posts. And of course, your post should be better than theirs! How else can the web evolve? Write for a persona. Keep a specific (or imaginary) person in mind who is a typical member of your target audience. Write as if you are having a conversation with that person. And write with a clear focus on your key phrases. For example, I am now helping Jennifer, the Non-fiction Author to write better posts by offering her this blog post checklist. Write a strong lead. Your post should begin with an informative lead that explains what the post is about. You could use it to summarize the post in two or three sentences. Or you can write it to make people very curious. Make sure the selected key phrases (or alternate versions of it) are repeated in the lead, preferably at the beginning. Write scannable text. Many authors write blog posts as big blobs of boring text. Don’t do this, I beg you! Use bold, italics, white space, bullets, quotes, numbered lists, take-outs, images, and anything else you can think of to make your text readable and scannable. And remember that your key phrases should appear at least once or twice in the remainder of the text, possibly in different versions. Use informative headers. Fling a couple of well-aimed headers into your text to divide the post in multiple segments. For small posts this won’t make any sense, or course, but for big posts it can be very helpful. You will make it easier for people to scan and understand the structure of the text, and it communicates your credibility, your command of the topic, and your ability to see beyond B and I in your text editor. Write with style. Write short sentences. Really. And make sure you write with a carefully chosen “tone of voice”. Emphasize your personality in your writing. Are you a serious person? Are you funny? Authoritative? Playful? Trustworthy? Out of your frickin’ mind? Your text should reflect the personal brand that you’re trying to build over time. Refer to your blog’s theme. Do you have a topic or theme for your entire blog? Consider mentioning it at least once somewhere in each blog post. The more often you refer to this topic or theme in different blog posts, the better your blog as a whole might rank for that topic on Google. And it helps people to understand what to expect from your other blog posts. For example, the purpose of my blog is learning about the creative economy, discovering new ways of work, and aiming for work-life integration. I intend for many of my posts to mention that at least once. End with a call-to-action. At the end of your post you should ask people to do something. Do you want them to add some comments? Subscribe to your mailing list? Follow you on the social networks? Write a letter to President Putin on rainbow paper? End your blog post with something that’s actionable. Double-check your writing. Are you really sure there are no spelling errors in your blog posts? No squiggly lines? No grammatical flukes? No inconsistencies in style? Read your blog post out loud. Come on, do it! I bet there will be at least one or two more things you can improve. Add a picture. Your blog post should contain at least one image. Use one of your own, or borrow one from Flickr’s Creative Commons collection (and don’t forget to credit the author). Make sure that both the file name and the Alt text of the image contain your selected keywords (keyword-phrase.jpg and Alt=”keyword phrase”). Add categories. Your blog post must be properly categorized on your blog. Categories not only help people find your blog posts later on, but they also confirm to the search engines what topic your blog post is about, especially when the categories are similar to your keywords. And it communicates you’re an orderly person. I like orderly people. Add tags. Use a small number of specific keyword phrases, in different versions, to describe your blog post in the form of tags. Reinforce the main topic of the page, and place the most important key phrase at the beginning. For example, this post has the tags “blog post checklist”, “great authors”, but also “checklist for blog posts”, “awesome authors”, “great blog posts” and “author checklist”. Cross-link to other posts. Add links in your text to earlier blog posts you’ve written, and make those links descriptive. (For example, a similar but simpler post of mine was called 7 Tasty Blogging Tips.) Many readers won’t follow these links, but the links between your articles will strengthen the credibility of your posts in Google’s search algorithms. Keep a short hyperlink. If you have a long title, consider manually shortening the URL of the post. Long hyperlinks can be a pain in the backside in emails, on social networks, and elsewhere. I didn’t think it was necessary for this particular post, but sometimes small is better. Publish on the social networks. Announce your new blog post on your own Twitter, LinkedIn, Facebook, and Google+ profiles and pages. Yes, it’s obvious, I know. Pick hashtags that go well with the selected keywords, categories and tags of your blog post. Use a scheduler (such as Buffer or HootSuite) to post a status update two or three times, for different time zones around the world. Offer to relevant communities. Submit the blog post to relevant communities on LinkedIn, Google+ and others that you are a member of. It is important that you don’t spam such communities! Only offer content that is truly valuable from their perspective, and only when you are an active community member. I only do this on rare occasions myself, because I don’t want to be seen as a spammer. But nevertheless I keep this item on my checklist. Just in case. Reply to other people’s work. When you’ve used or referred to materials from other people, let them know. Maybe you were inspired by an article in a magazine, or your blog post is a reply to someone else’s post, or you used a photo from Flickr, or an idea from a SlideShare presentation. Let those authors know. People like being quoted. Trust me, I know. They might even retweet your post. Measure the outcome. Now let’s go back to the beginning. Did you decide to use some metrics for your blog post? A certain number of page views? New subscribers to your mailing list? The number of likes for your Facebook or Google+ page? What is the result? Did you get what you wanted? If not, what have you learned? How can you do better next time? And break the rules! Last but not least… Don’t do everything that I described here. Don’t follow slavishly what other people are saying. Don’t ever be boring! What an impressive post! It’s a credit to your need to quantify your article.